You'll be £4.99 closer to your next £10.00 credit when you purchase Fortress Kent. What's this? Since the dawn of civilisation, Britain has been menaced by foreign powers and invasive hordes, anxious either to pillage and plunder or to invade and rule over this green and pleasant land. Situated on the extreme southeastern corner of England, the county of Kent is the nearest point to continental Europe, and has so been the targeted landing point for most of these incursions. From the time of the Angles, Jutes and Saxons to the Second World War, the Men of Kent and Kentish Men have had to set up and maintain defensive structures, from Norman castles to 1940 pill boxes, from the Royal Military Canal to the anti-tank ditches carved out of the hills around the coast. This book is the story of these: the threats which led to the erection and construction of various defensive obstacles, their up-keep and garrisoning and, in some cases, their ultimate destruction. I recommend this book to anyone who wants to understand the military history of Kent from Roman times to the era when a secret regional seat of government was set up beneath Dover Castle. Since the dawn of civilisation, Britain has been menaced by foreign powers and invasive hordes. From the time of the Angles Jutes and Saxons, through to the Fist, Second and Cold Wars, this country has seen the construction of numerous defensive structures. All of these areas are investigated by the author. This book provides biographical details of VC recipients who had a connection with the county of Kent. An introduction gives an overview on the history of the VC and its origins. A total of 53 recipients are covered, the majority are from the two world wars. A useful book for the general reader interested in Kent. Here we have Roy Ingleton covering the prime candidate for front-line status. 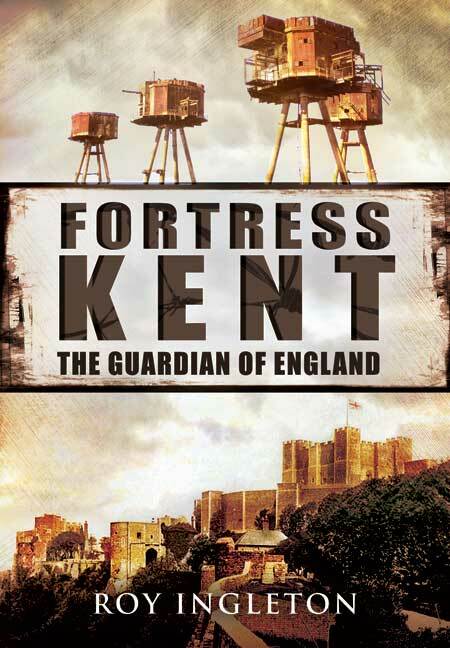 His sub-title 'The Guardian of England' highlights the vulnerability of invasion of Kent, the nearest point in England to Europe. The author lives in Maidstone and specialises in the history of Kent. This is a unique military history of Kent. It is very readable, is constructed in great detail throughout and is well illustrated. From the time of the Saxons to Word War II, men of Kent have had to set up and maintain defense structures, from Norman castles to poll boxes. This book is the story of the threats which led to their construction and, in some cases, their ultimate destruction. Roy Ingleton is a professional writer and translator. He lives in Maidstone in the heart of Kent. Roy has written extensively on criminal and police history and the history of Kent. His best-known books are Police of the World, The Great Debate: Arming the British Police, The Gentlemen at War: Policing Britain 1939-1945, Policing Kent 1800-2000, John Gott: A Life in the Fast Lane and Kent Murder and Mayhem.